This is a photograph of Fred Everett McManis who was born about 1883 in Olivet, Kansas. 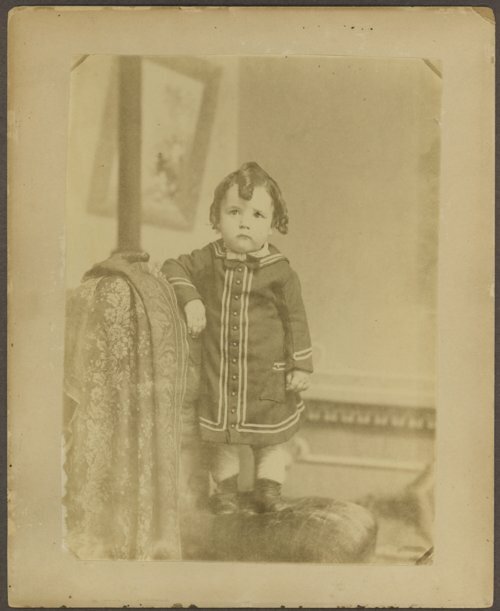 He was four years old when this photograph was taken. McManis married Gertrude Werden Shofe in 1906. They had five daughters: Ruth Ella McManis, born 1906 in Hunter, KS; Amy Carmen McManis, born 1908 in Hunter, KS; Irwina Myrtle McManis, born 1910 in Stockdale, KS; Margaret McManis, born 1912 in Manhattan, KS; and Edith Gertrude McManis, born 1915 in Manhattan, KS. The family later lived in Manhattan. Fred McManis died July 30, 1960, and is buried in Sunset Cemetery in Manhattan.